A few weeks ago The New York Times published an article about a divorce in the United Kingdom caught my attention. The article was called “Divorce on Demand? In the U.K., It’s Not Quite That Simple“. Does the UK have “divorce on demand”? What even is divorce “on demand”? Can spouses in New Jersey get a “divorce on demand”? husband, Hugh, and into a neighboring property, claiming that he had verbally abused her. Tini filed a divorce complaint against Hugh, but Hugh objected and contested the grounds for divorce. Their trial judge in his written opinion sided with Hugh, finding that Tini had not made out sufficient grounds under their divorce statute to divorce Hugh. What is familiar to me about this case in the U.K. is that it is not uncommon for a client coming to me seeking a divorce, knowing that his/her spouse does not want to divorce, and wondering if the other spouse can object and stop the divorce. Or a client will be the one who will want to contest the divorce and remain married. How is this possible? In the U.K. case case of Owens v. Owens cited by the New York Times, Tini was not able to obtain a divorce “on demand” from Hugh because the law in the U.K. allowed a couple to divorce, even where one party objects, only when the spouses have been separated and living apart for five years. For Tini, this will not be until 2020. As an alternative, litigants in the U.K. can divorce pursuant to a law that allows divorce on the grounds of adultery, abandonment or “that the respondent has behaved in such a way that the petitioner cannot reasonably be expected to live with the respondent.” These are the grounds by which Tini sought a divorce. In the U.K., it seems that the vast majority of divorces are uncontested. Of the ones that are contested, very few go to trial and require a judge to decide if the grounds for divorce are met. In Owens, the trial judge struggled with what the threshold standard is for “reasonably” expecting someone to remain married. Could the standard in 1973, when the law was enacted, as to being expected to reasonably live with someone be the same standard to apply to a couple in 2018? The trial judge found that Tini’s assertion that she had been verbally abused did not meet the standard for to divorce, because she did not establish that she could not be reasonably expected to continue to live with her husband. The trial judge suggested that Parliament might want to consider replacing this law. New Jersey does not have divorce “on demand” per se. That is not how I would think of it. However, if the Owens family lived in New Jersey, they would probably be divorced by now. When I started practicing family law years ago, the most common ground for divorce under our New Jersey statute was either 18 months of separation (not 5 years as in the U.K.) or “extreme cruelty”. If a couple had not been living apart for at least 18 months, and did not meet any other standard for divorce (ie. adultery, desertion etc. ), litigants would be required to list the specific instances of the other spouse’s “extreme cruelty” in the complaint for divorce that made it unreasonable for him/her to continue to live with the other spouse. This is similar to what Tini Owens attempted to show in her complaint for divorce against her husband. Sometimes litigants are perfectly happy to list all their grievances with the other spouse and all of the bad acts that the other spouse engaged in during the marriage which lead that spouse to want to file a complaint for divorce. Others, however, did not want to do this because they just wanted a divorce without having to air their “dirty laundry” or embarrassing episodes in the marriage in a public document like a complaint for divorce, or they did not want to create or exacerbate an already angry or tense relationship by listing everything bad that the other spouse had done during the marriage. Sometimes spouses wanted to divorce even though their spouse was not particularly cruel. Some spouses felt that the marriage was just a mistake. Perhaps they had grown apart or grown more distant and did not have that much interaction. Perhaps they were bored with the other spouse, or they had grown apart, or that they no longer had anything in common. Perhaps they just bickered and fought all of the time and wanted to end the marriage before they became “extremely cruel”. Perhaps they feared listing bad acts of the other spouse would make the other spouse more angry and less inclined to negotiate a settlement. Also, having to list these acts of the other spouse opened the possibility of the other spouse contesting the divorce and the judge finding, as he did in the Owens case in the U.K., that one or both spouses were not cruel enough that it was unreasonable for them to continue to live together. Does that mean that they are stuck being married unless or until they live apart for 18 months or they engage in worse bad acts towards one another? 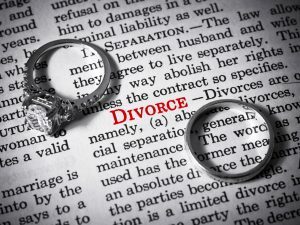 In 2007, New Jersey added to its statute listing the grounds for divorce, the grounds for “irreconcilable differences”. This is a “no fault” basis to get divorce. The spouses do not have to point the finger at one another or blame the other for the demise of the marriage, nor do they have to list all the ways in which the other spouse wronged them during the marriage. The other spouse does not have to be shown to be cruel at all, much less extremely cruel. A plaintiff simply has to assert that irreconcilable differences have arisen in the marriage which have caused the breakdown of the marriage for a period of at least six months, and which make it appear that the marriage should be dissolved, and that there is no reasonable prospect of reconciliation. This is not a difficult threshold to meet, so it is not as easy for the other spouse to contest the divorce. Additionally, rather than requiring litigants to focus in the divorce complaint on why the marriage ended and requiring them to say negative things about the other spouse, they can focus on how to resolve the financial issues and custody issues in their cases with less anger. That is the hope anyway. The reason I disagree with the term divorce “on demand” is because it suggests that litigants are promised a divorce that is as quick as they want. How quick one’s divorce is has more to do with the complexity of the issues and the reasonableness of the litigants to compromise and settle their case, than on the grounds or reasons that they are divorcing. The law office of James P. Yudes, P.C. is happy to guide you through these issues.